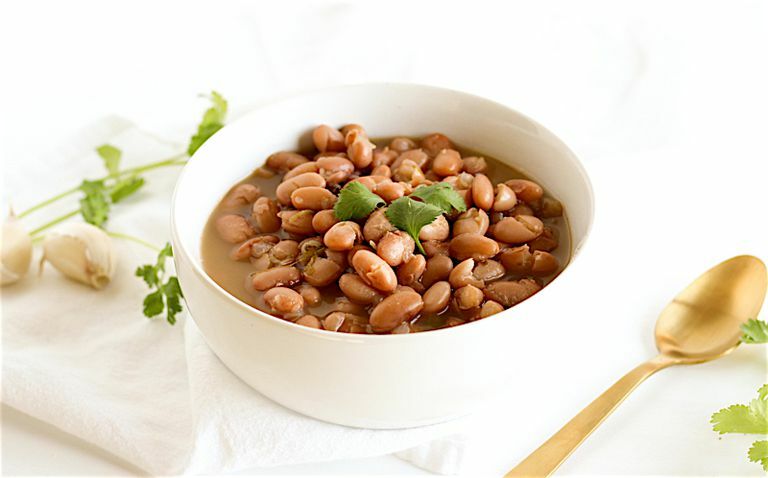 Pinto beans make a super filling, inexpensive, and easy meal. Thanks to 12 grams of protein and 12 grams of fiber in a single cup, beans keep you full for hours and are great for your heart, waistline, and digestive system. Making pinto beans in the slow cooker is an easy way to have a meal ready when you get home from work. Just dump everything in and walk away while they cook. Making them at home also lets you control exactly what goes into them. Canned beans are great in a pinch, but sometimes it’s hard to find some that don’t have any salt added. These slow cooker pinto beans are flavorful, without the salt, when simmered with garlic, jalapeno, tomatoes, and spices. The recipe makes a large batch so you can bring them to potlucks or eat some now and freeze some for later. They make great additions to salads, tostadas, tacos, and more. Soak beans overnight: Pour beans into a large bowl or pot. Sift through and pick out any small rocks that may be present. Cover beans with water (at least 3 inches over beans) and let sit on the counter overnight. If you forgot to soak the beans, use the quick soak method (see cooking tips). Drain and rinse beans. Place in the bowl of your slow cooker. Add onion, garlic, jalapeno, cilantro, and ham hock, if using. Add spices and tomatoes and fill with enough water to cover beans at least 2 inches with water. Place lid on the slow cooker and cook on low 6 to 8 hours or on high 4 to 6 hours, adding more water as needed. Leave out the pork for kosher or for vegetarian. This recipe will also work with black beans, which are just as nutritious. For quick soak method, rinse and drain beans. Add to a pot and cover with at least 3 inches of water. Cover, turn heat to high and bring to a rapid boil for 1 minute. Remove from heat and let soak, covered, for 1 hour. Then drain and proceed with the recipe. Serve alongside a green salad and cornbread for an easy and delicious meal, or use in tacos, salads, etc.